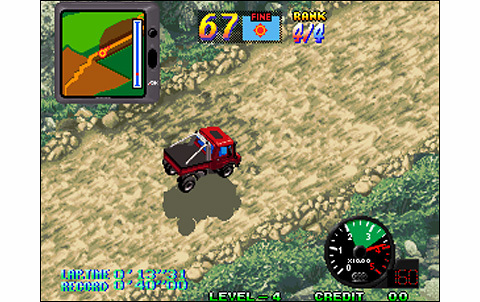 On Neo Geo, there are only four games dedicated to motorsports: Riding Hero puts you behind the handlebars of overpowered motorcycles, Neo Drift Out and Thrash Rally offer to participate in the World Rally Championship, and Overtop puts the player in control of eight different cars for a race against the clock. 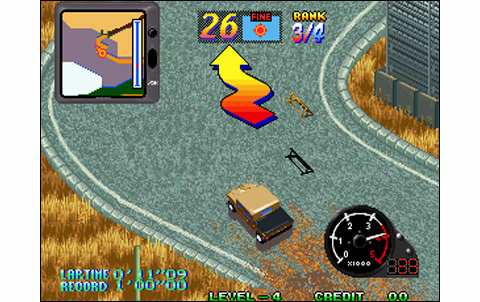 You'll have to drive on various grounds: asphalt, dirt, snow, sand, etc.. Before the 3D simulations came and revolutionized racing games, those often used an aerial view and a multi-scrolling (F1 Dream, F1 Grand Prix, Driftout, Thrash Rally). 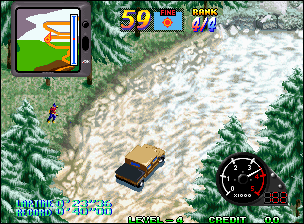 The genre was also declined on one side in an awkward 3d (Out Run, Hang-On, Stunt Car Racer) or in isometric view "3/4 high" (Mille Miglia, Super Off-Road, Drift Out 94 ') . 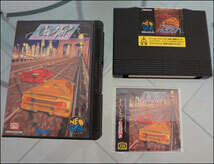 It's prceisely this king of gameplay that was chosen for Overtop on the Neo Geo, and regarding the 2-D capabilities of the system, we can expect beautiful graphics and smooth and fast scrollings! The fashion of CG (Computer Graphics) is in full swing back when the game was released, and we are granted a 'digitized' introduction, and beautifully modeled vehicles . 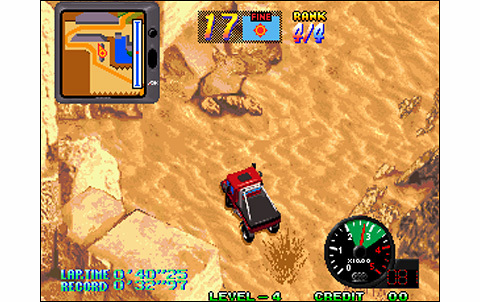 The backgrounds are varied and well-designed: we go from dirt to asphalt, then to the potholed roads and undergrowth, and finally through desert and snow... all on one small island, amazing! Japanese are really incredible. Let's also emphasize the quality of the animation: if the game doesn't feature in and out zooms like Neo Drift Out, scrollings are nevertheless smooth and fast, and the animations of vehicles are perfectly decomposed. 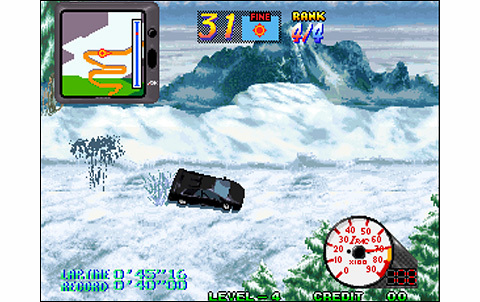 The care provided to the whole realization is significant, with many small details adorning the race: snow, rain, water, destructible obstacles, vegetation, spectators ... and the icing on the cake, there is no slowdown to report. The audio part is rewarded with musics ranging from calm jazzy ballads to ultra-speed techno mixes (that sounda little like Thunderdome, for those who know), but also other themes packing some good guitar riffs. 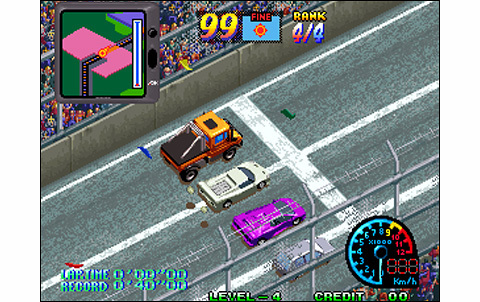 We also note that the sound effects are excellent, with successful engine sounds, as well as the screeching tires and other noises of shock and drifts. 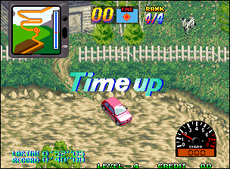 We have a GPS in the top left of the screen, plus instant road indications (turns, obstacles, like a co-pilot) with arrows that appear on the screen; there's remaining time indicator, position, weather , but also the chrono, tachometer and rpm. These are specific to each of the eight cars available, which is a nice detail more. 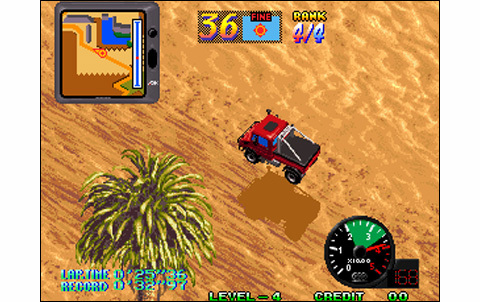 Choose among these babies: Lamborghini Diablo, Ferrari F50, Hummer, Jeep, Super Tenere (motorcycle), a Paris-Dakar truck, but also Mitsubishi Pajero and Peugeot 106. Ok, vehicles in the game have different names (not expensive enough, my son), but they are quite lifelike. If Lamborhini and Ferrari seem unbeatable on the roads, on dust rocks, rough tracks or snow, things are different and other machines may take advantage! 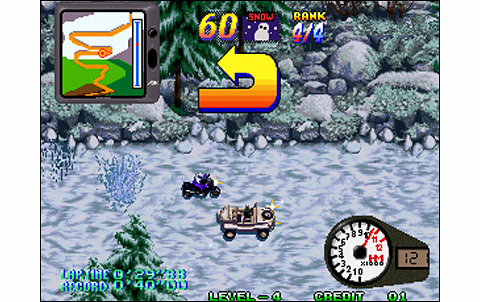 Peugeot 106 for example is comfortable almost anywhere, such as bike and truck, while the Pajero, Jeep or Hummer are at home on uneven surfaces. 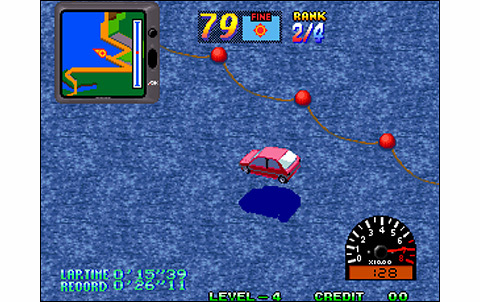 The steering requires a period of adaptation, especially to control drift and high speed turns: the game is fast, so much that it takes good reflexes and fine pilotage to overcome. Left and right on the stick control direction, A accelerates, B brakes, andd emergency braking is performed by pressing twice B. Then once stopped, the same button activates reverse gear. 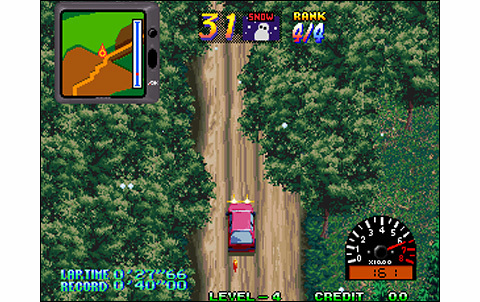 The technique is important to control your drifts: you must quickly press the brake at the entrance of the turn and start to turn the steering wheel to launch the vehicle in a controlled drift. Another great feature: Overtop is full of shortcuts and secret passages to improve your chrono. Depending on the vehicle you're using, it might be better to stay on the asphalt... So you choose well your route. 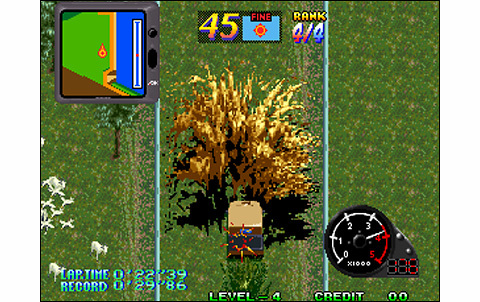 The single raceof the game, divided into seven stages, takes about five minutes to clear. It's not very long, but the many passages to find, the eight vehicles and racing against the clock might have you coming back for more. 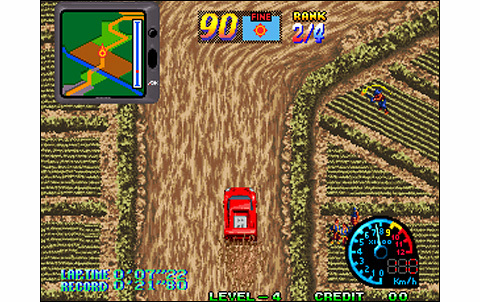 In addition, it is possible to spice up the difficulty by setting more laps via options. Here's another good ADK title, offering nice realization and gameplay, despite a limited life. 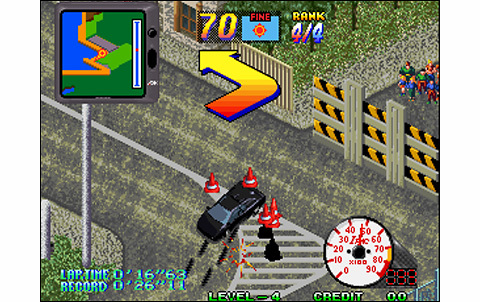 The only event of the game is made of seven stages, but these are colorful and varied. Vehicles are well made too, for a graphic set overall looking good! 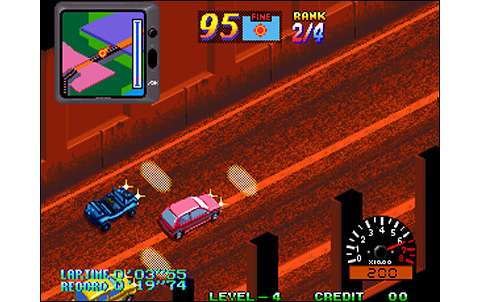 The speed factor is what counts in this type of game, in order to solicit player's reflexes. Overtop does it perfectly, being further fluid and rich with details. There are various musical themes in different styles, and the effects are quite good, especially engine sounds. 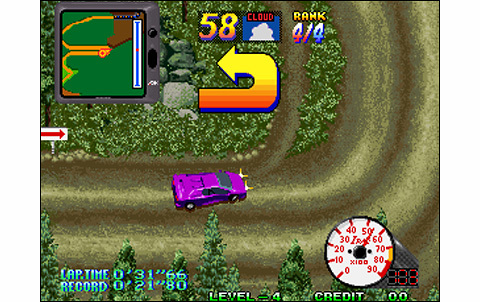 If the game is cleared withing five minutes, there's plenty of reasons to come back to it: eight different machines, shortcuts to discover, race against the clock, plus the ability to set more laps and increase difficulty! 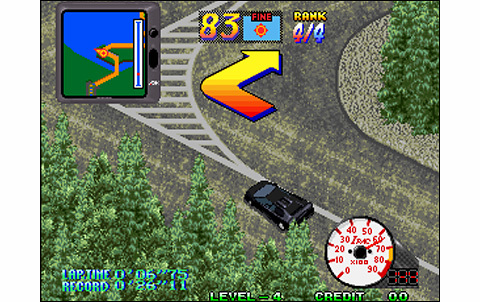 The game offers excellent sensations, but requires a little adaptation time to learn drifting. Mastering the fastest cars of the game will take some time! 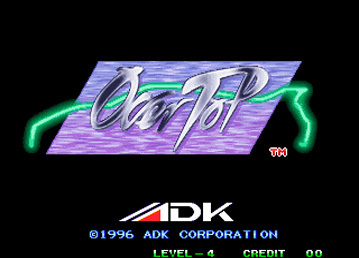 Overtop is a serious rival for Neo Drift Out: with its numerous vehicles, its nice graphics and its stages full of secret shortcuts, it's a great racing game! 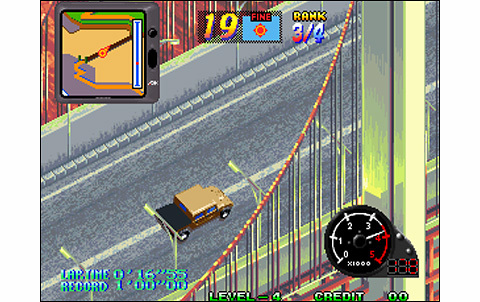 Overtop is one of the rarest Neo Geo games. Only released in japanese version, it has reached a four-digit value since a few years. 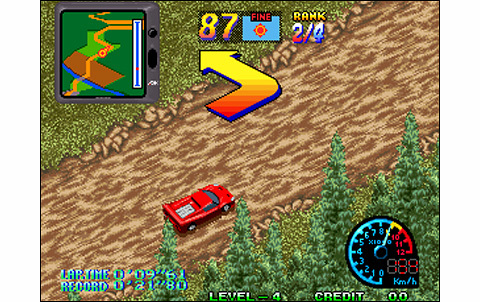 So, I highly recommend players to choose Thrash Rally instead, much cheaper and not too bad!